The XIVth Popes are pretty impressive Pontiffs. We know and love Papa Ganganelli – Clement XIV of Happy Memory – in particular for his suppression of the Jesuits. 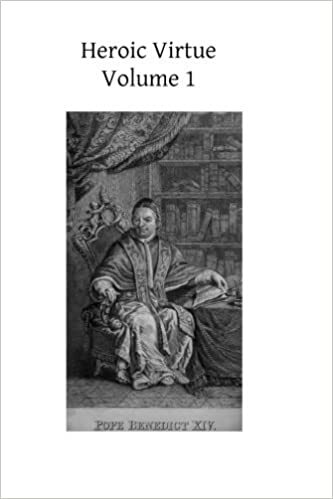 But let us also consider the greatness of Papa Lambertini – Benedict XIV of especially Happy Memory – for his many gifts as a scholar and jurist, as a humanist and wit. If Clement XIV is famous for having given the Jesuits their due, Benedict XIV was the Pope to whom canonists and those who work on causes of saints refer to as “The Legislator”. We are still – with some changes here and there – using his basic process for beatification and canonizations. Benedict is well-known for many things, but here is something which we will all find delightful: he sternly forbade service of women at the altar for Mass, and he included the notion of “deaconettes”. In his 1755 document Allatae sunt Benedict, who saw that a terrible practice has slithered in among some Greeks, he in the sternest way forbade “altar girls” and any thought of female deacons. For this alone, Benedict deserves his very own FR. Z SWAG! And… wear him with pride! Enjoy your mug with some MYSTIC MONK COFFEE or TEA! This entry was posted in In The Wild, Lighter fare and tagged Benedict XIV, Papa Lambertini, Z-Swag. Bookmark the permalink. God grant us a Leo XIV! In addition to getting several of these Pope Benedict XIV mugs and giving them as anniversary of ordination gift to priests, I recommend to your readers “Heroic Virtue: A portion of the Treatise of Benedict XIV on the Beatification and Canonization of the Servants of God.” This two volume work is available through Amazon and not only clarifies the mind wonderfully, but is full of incident and interest. In other words, St. Hilary is held to be an example of heroic virtue not in spite of this self-imposed holocaust, but BECAUSE of it. Of course, if one were to do the same thing with the intention of ending his life more quickly, that would be suicidal and in violation of the Fifth Commandment. In all seriousness, it seems to me that a false understanding of this issue is an obstacle both to sanctity and to grace. The Cure d”Ars, patron saint of priests, had very little regard for preserving his health or his life in his service of his penitents. If he had, there is little doubt that things would have been very different in Ars, and in the lives of many people. The railroad spur to Ars never would have been built without a living holocaust at the end of the line. I doubt very much that there is a spiritual director anywhere in the world today that understands this matter as did Lambertini and his authorities—or saints such as St. John Vianney or St. Hilary and innumerable others. And that includes directors and abbots within the penitential orders. Take a tour of the websites for the various Cistercian ( Trappist) monasteries in the English-speaking world, and you will find them very dismissive of their Trappist heritage. The emphasis now is on “contemplation” not penance. de Rance, the founder of the Trappists, has essentially been kicked out his own order posthumously. And greatly because of this, I think —the deprecation of penance— this once heavily penitential order is imploding both in numbers and in charism. The Trappist elements have largely been mitigated away, and the specifically religious aspects such as enclosure are now giving way. At bottom is bad theology deriving from corporate amnesia of Lambertini et al. He’s a favorite pope of mine. It’s also fun to point out to feminists who think the Church hates women that he appointed two women as math professors in universities (including Maria Agnese). [I didn’t know that!] He also approved the blessing of the medal of St. Benedict. A great man indeed. He was justly famous for his witticisms. He used to say: “I like a lot the company of Jesus, not of Jesuits” (“Mi piacetanto la compagnia [in Italian “compagnia” also means “society”] di Gesù, non dei gesuiti”). Imigilbert wrote, “Our mantra seems to have become, “Careful, careful . . . don’t overdo” with regard to rigorous penance. I suppose it might not be going too far for a layperson with family responsibilities to use the following checklist before planning to undertake a truly *heroic* penance: “Is my spiritual life already in very good order for a lay person: am I attending daily Mass and receiving Holy Communion, *every day*, and making a Holy Hour before or after Mass *every day*, examining my conscience for at least ten minutes every evening, going to Confession regularly, saying the Rosary daily (or some other devotion), reading and meditating on Holy Writ daily? Am I conscious of any attachment to any mortal or venial sin – wrath, lust, avarice, etc. Are my family and I arriving to Mass on time most days, or are we habitual stragglers-in? And is the religious education of each of my children where it ought to be for their age? Am I already doing one or more ORDINARY penances regularly, such as abstaining from meat on Friday? Am I giving generously of my time and energy to my own family – spouse, children, relatives near and far (especially older ones, who may be lonely)? (I can do the latter by phone calls, notes, emails, and SACRIFICE of my time and cash by VISITING them periodically, if only for a day or two.) Am I listening to my little ones, knowing what is in their hearts and minds, what they are learning in school, what their cares and worries are, and taking time to give them my parental guidance and PRAYING WITH THEM about their lives? EVERY DAY? Are my spouse’s and childrens’ material needs being taken care of – do I keep up my strength to earn sufficient money not for a luxurious way of life, but for ADEQUATE shelter, clothing, decent food, transportation, medical care when needed? Are my children being read to, listened to, played with, every day by both my spouse and me? Are my children bathed daily with their hair neatly cut and combed daily, their clothes and their shoes clean, pressed (if needed) and not OUTGROWN, as children grow so fast. Would my childrens’ schoolteachers agree that their parents are staying on top of their homework, participating well in school activities, staying involved in their childrens’ education? Am I listening carefully to my spouse, and spending at least a quarter of an hour each day giving him or her my UNDIVIDED ATTENTION? Am I paying attention to the things he or she does well, and complimenting him or her regularly on them, and expressing my gratitude for them? Am I bestowing other tokens of affection that I know will mean a great deal to him or to her, every day? In pursuit of the above, am I making myself REASONABLY presentable and attractive for my spouse – not like a film star or other celebrity who care for their appearance above all – but, am I keeping myself reasonably trim and fit for someone of my age, in the habit of grooming myself well, including attention to hair, hands, teeth morning and night . . . so that my spouse doesn’t have to live with a run-down, unkempt, unpleasant-smelling partner? Am I in the habit of bathing at least every other day, or daily in warm weather? Are my clothes clean and presentable always, and do I dress properly and suitably for the occasion? Am I living simply so as to give of my time, talent, and treasure (ALL THREE) to my parish as well as to the poor: making myself one of the right arms of my pastor, in addition to giving sacrificially to those in need throughout my community? Am I regularly praying for my family and friends, for my parish and its priest, for our Pope and bishops, and for the poor? Are my house or apartment and car(s) kept regularly in good repair? Are my spouse and children comfortable inviting friends and playmates into our home – or do they avoid this, because things are messy and dirty and in disorder most of the time? If I don’t have the skills or strength to make the necessary repairs or do the necessary chores at home myself, am I working the hours necessary to hire someone to take care of this for us? Is my family able to find necessary items promptly – homework, boots, jackets, lunch boxes, keys, purses, phones? Or is it a mad scramble every morning because things are so out-of-order? Are there missed appointments and late fees for unpaid bills in my home because my spouse and I don’t attend to these things with enough attention? And again, am I taking reasonable care of my health through not smoking, not drinking to excess, eating a proper diet, exercising, and receiving regular medical check-ups, and complying with my doctor’s orders, not out of selfishness or an undue attachment to material concerns, but out of CHARITY and JUSTICE, because I have it (to some extent) in my power to give my spouse and children a better future (and that of my community), that they will less likely be burdened with a 57-year-old or 62-year-old family member confined to bed or to a wheelchair through ill-health (history of heart attack or stroke) or a 75-year-old confined to bed (history of no exercise for many years, leading to muscle deterioration)? And despite knowing that people who are quite fit and health-conscious become disabled and/or die prematurely, am I willing to DISCIPLINE MYSELF in these regards, taking proper care of myself to this extent at least, so as to have reason TO HOPE TO spare my relatives from such burdens in the future? If the all of the above may be affirmed in a positive way in the daily life of a lay person for quite some time and have become habitual, then I would say that it’s time to approach one’s pastor or spiritual director for permission to undertake some additional, HEROIC penances. And if more than one or two of these items seems not quite where it should be, may I suggest that such a lay person would consider attending to these DAILY DUTIES first? and then when well-established in one’s routine, to go looking for extraordinary penances to do? Wasn’t this the Pope of snuffbox fame? For those of us who are not in funds, Heroic Virtue is on the Internet Archive. The reason mortification of all sorts became somewhat deprecated was that some folks used to overdo it, out of spiritual pride, and then crash spiritually. This is pretty easy without a steady regime or good advice. But what should have been just a pullback has become total retreat, because sentience does not seem modern. Another factor is that, even though many modern jobs are sedentary, employers demand a more constant mental attention than in pre-modern times. Most modern non-sedentary jobs are extremely rigorous and do not permit rest or adaptation without being fired. Fasting which prevents employment of those with obligations to support themselves or a family has always been deprecated. Without strong, experienced lay support, it is harder for religious and clergy to gain experience in fasting. Not impossible, but harder. Father, One of the worthwhile and liturgically interesting documents produced by Pope Benedict XIV does require that the Holy Eucharist should only be distributed at Mass from the Mass being offered and not from the tabernacle. A document that unfortunately is still being ‘obeyed in the breach’ in many parishes, convents, monasteries, etc. I, at least, would be very interested in seeing an accurate translation of this document. “The full, conscious, and active participation of the faithful in the Eucharistic liturgy is most clearly expressed by the reception of hosts consecrated at the same Mass rather than by the reception of hosts reserved in the tabernacle. In modern times, the importance of communing from the gifts presented and consecrated at the same Mass in which one is present has been stressed by Pope Benedict XIV (“Certiores Effecti,” 1742), Pope Pius XII (“Mediator Dei,” 1947), and the Fathers of the Second Vatican Council, who stated: “That more complete form of participation in the Mass by which the faithful, after the priest’s Communion, receive the Lord’s body from the sacrifice, is strongly endorsed” (CSL 55). The Catholic Review (a publication of the Archdiocese of Baltimore), October 7, 2017. 1) When Pius XII cited (CTS translation of Mediator Dei para 126) the Bull Certiores effecti of Benedict XIV (13 November 1742; Magnum Bullarium Romanum 1752 Luxemburg edition pars decima pp 117-8) he misrepresented that Pontiff. Benedict is there dealing with a controversy “de obligatione, qua sacerdotes Missas celebrantes adstringantur Eucharistiam ministrare intra easdem fidelibus iis, qui ad ipsam accipiendam paratos se exhibent, ac petunt sacrificii, cui adstant, participes fieri”; that is, he is dealing with the desire of the faithful to receive Communion within the Mass itself and not at some other time from the reserved sacrament. Benedict is not dealing with some convenient pastoral habit by which a tabernacle is kept charged with full ciboria for the convenient and frequent communion of large numbers. I doubt (think about it!) if that habit was common two centuries before S Pius X made frequent Communion the general practice.